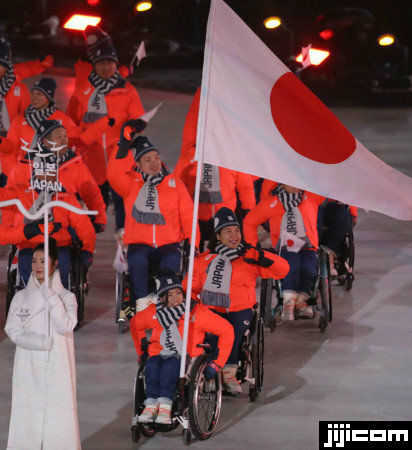 Japanese Paralympians grabbed a record 10 medals--three golds, four silvers and three bronzes--after tough competitions in the March. 9-18 Pyeongchang Winter Games in South Korea. Alpine skier Momoka Muraoka, the Japanese flagbearer, demonstrated her superb racing skills, winning one gold, two silvers and two bronzes. Other members, both veterans and rookies, also marked remarkable achievements. Yoshihiro Nitta, who made the Paralympic team for the sixth time, earned a gold and a silver at Nordic cross-country events for men, while snowboarder Gurimu Narita captured a gold and a bronze in his Paralympic debut. Taiki Morii came second in the men's downhill sitting with marginally behind the winner, capturing a silver for the fourth consecutive Games.